Herb Lainchbury: Are you really ready for more? Are you really ready for more? 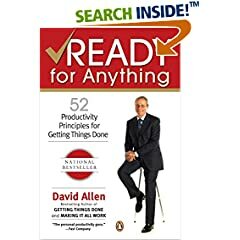 I am currently reading Ready for Anything by David Allen. In chapter 11, titled The deeper the channel, the greater the flow, David talks about how sometimes when an opportunity comes up for us, we get a little internal danger signal, like a tiny little "uh oh" feeling from inside. Most of us say we want more business, more clients, more money, more responsibility, more fun, more time. But do we really? He says that because we have this subconscious resistance we actually miss a lot of opportunities for these things we say we want. Why? Because what we want is only a part of what is considered when we choose what to do. When some part of us isn't prepared to handle the opportunities that are presented to us, we resist them and we let them slip by, unrecognized, or even when we do recognize them we push them away in subtle ways. Are we really prepared to recieve the things we say we want? We are often defeated by our concern of what will happen if we actually take on one of these opportunties. I say get prepared for success. Find out what's keeping you from recognizing these opportunities for what they are and deal with it. Are you not paying yourself enough? Do you have too much overhead? Are there issues in your relationships with others that need to be resolved? Deal with them because to see these opportunities for what they are, you have you have to stop stopping yourself. Allen advises, take a risk, and do what you need to do to get back to eagerly anticipating the ringing of your bell. I couldn't agree more. Life's to short to be afraid of your phone ringing.